Author's Note: Three years ago yesterday, Brian Jacques, author of the Redwall series, passed away. This post is dedicated to him. I confess to being in two minds about Redwall. On the one hand, it is a highly entertaining series which is probably what got me into serious reading in the first place, not to mention being one of my primary inspirations. On the other, it harbors a series of major problems, being an imperfect work. But then again, I have yet to find a work totally devoid of defects. Call it Thud and Blunder for kids, but it continues to have a special place in my heart, up there with Bionicle and Adventures in Odyssey. The Redwall series is a long running saga of books written by British author Brian Jacques. It follows the generations of anthropomorphic animals living out of and around the firmly-acknowledged-by-the-author-to-be-non-religious Redwall Abbey. There are mice, squirrels, moles, hedgehogs, badgers, otters, shrews, hares, and the odd vole and rabbit, firmly on the side of good. Of course, you can't trust any of those rats, ferrets, stoats, weasels, pine martins, foxes, some wildcats, and other "vermin," who are always "baddies," as Jacques describes them in the Redwall: Friend and Foe book. Sure, there's been the occasional good rat or something, but their capacity for being completely depraved and evil is described in The Sable Quean as "natural." Anyhow, there are all sorts of epic adventures, battles, and quests in and around Redwall Abbey, Mossflower Wood, Salamandastron, and the surrounding area. It's all quite grand, really. The inhabitants of Redwall Abbey are devoted to love and peace, and are protected by the guardian spirit of one of their founders, Martin the Warrior, whose image is emblazoned in a tapestry in the Great Hall. Martin's presence, along with his legendary sword, is one of the only threads linking the books in the Redwall series together, aside from the locations and some mention of past names. Nearly all of the books start over with a completely new cast of characters, with only two sets being direct sequels to the other (Redwall & Mattimeo and Mariel of Redwall & The Bellmaker). There are some characters who hold over across multiple books, such as Cregga the Badger, but that's about it. The world suffers from a case of medieval stasis, being locked in a perpetual era of swords and armor and whatnot. There are no humans, though dogs and horses are present in the first book. This is easily explained by Brian Jacques as products of his earlier efforts at writing. 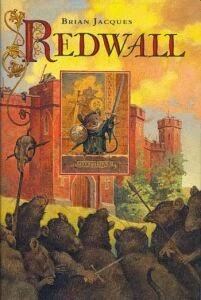 The first book, Redwall, was never intended to be published at all, having been written by Jacques for a school for blind children, which explains why his books are so descriptive. At any rate, Jacques never intended to write a sprawling, nigh-unending saga, which probably explains why frequently chooses to start over with most books. He wrote the series right up until his death three years ago today, always insisting that he never stopped because of the enthusiasm of his fans, consisting mainly of younger audiences. I grew up fascinated by his books. I was constantly reading and rereading these books, loving Redwall and every book after. I own several of the books, including Redwall, Mossflower, The Bellmaker, Taggerung, and Eulalia! From Matthias' stumbling in the orchard to the defeat of the Sable Quean, I've read all of these books from end to end, usually within a matter of days. I have yet to read The Rogue Crew, the final book in the series, but I earnestly look forward to it, and hope for the best. The Redwall series, like the Artemis Fowl series, is a real something because it got me thinking. Thinking about adventures and quests and weapons and armor and what not. I'd say that it's one of my primary inspirations for the fantasy novel I'm writing. It helped that an old friend of mine, Mason, was really into it. I think his favorite of the books was Rakkety Tam. Common staples of the Redwall books include overwhelming odds against our heroes, quests for some kind of Macguffin, witty dialogue, rousing and often funny songs, and overly detailed descriptions of food which sounds positively delicious. Don't believe me? Check out the honest-to-goodness-one-hundred-percent-legit Redwall Cookbook. I proudly own it. There was even an album based off of the numerous songs in the series. But all levity aside, what really makes the Redwall series shine are the unforgettable characters, mainly villains. From Matthias to Zwilt the Shade to Basil Stag Hare to Luke the Warrior, most of them remain firmly entrenched in my mind. Of course, it doesn't stay that way for the whole series, but we'll get back to that in a minute. I'll admit, it's been a while since I've read any of the books in the series, but even if I was still rereading them, I think it would still be hard for me to pin down a favorite. We've got the first book, Redwall, which set the bar for all the rest. I always liked Taggerung a lot, though I've learned from further development of my sense of criticism that it's a strong case for Jacques' overly-simplified, even racist, portrayal of good and evil, but more on that later. Probably the best book in the series is Martin the Warrior, which explores the origins of the titular character, carrying with it probably the apex of pathos in the entire series. I guess my overall favorite book (without having read The Rogue Crew, of course) is the aforementioned Redwall, which has this epic quest, an awesome villain in Cluny the Scourge, great, intense drama, a splendid cast, and a climactic resolution. Redwall has a great, spread out legacy, having spawned a Canadian animated series which ran for three seasons (based off of Redwall, Mattimeo, and Martin the Warrior, respectively) and a graphic novel based on Redwall. As of this writing, there's a movie currently trapped in development Hades, and someone is putting together a Mindcraft based on it. However, there are three serious flaws within the plot structure of the books, especially the latter ones. Firstly, the same plots tend to get reused and rehashed over and over again. There's an invading hoard, or a treasure hunt, or a kidnapping plot, or a deadly monster sweeping through Mossflower, or the characters go to this island, or a revenge quest, Salamandastron under assault, a bunch of these mashed together, etc. They've all been done to death and it wears on you after a while. I suppose that when you've got 20-odd books, nearly all of which have completely different casts, it's bound to happen. Which brings us to the next problem: Characters. In the early books, the characters were developed and interesting and fun to watch. I loved Matthias and Cornflower and Basil Stag Hare and Constance and the rest in the first two books, but as the books wore on and the casts were changed for every single one, things changed. Towards the far back half of the series, the characters began morphing to archetypes. Naive, inexperienced, adventurous young mouse? Check. Kindly, clever mole? Check. Pretty young lady mouse/squirrel? Check. And so on and so on. The same problem applies to the villains, but to a lesser degree, because Jacques has a tendency to write really cool, interesting, awesome villains. They're cool enough to like but evil and dangerous enough to hate. Most of them are pretty memorable, and stand out on their own as the main attraction of the book, one-upping the heroes quite a lot. Unfortunately, one of the best things about the Redwall series is also one of its biggest problems. But all of my gripes aside, I wouldn't be where I am today as a writer or a reader if it weren't for these books. They opened up my imagination and got me really thinking. I've said it before and I'll say it again, these books are one of my prime inspirations. It's the rollicking, even moving adventure that I love about these books that gets me excited to read stuff. I'll always hold them in the highest esteem, and I'll be glad when I get to read The Rogue Crew. For those of you who have read it already, feel free to let me know in the comments section if it's any good.